Material: Acrylic. Clean the surface before application. Material: Acrylic. 1 x Holder. Clean the surface before application. Space-saving, will not occupy your worktop. Simple installation with the strong sticker. Hex Headset Hook - INTRODUCTION PRICE. - Clean & organise your PC Desk area/work space/gaming area. - Simple design, small in size and lightweight. - Colour: Black, size: 7.5 2.5 5.3 cm. Bluetooth Speaker. Material: Acrylic. Clean the surface before application. New Arrival. Simple installation with the strong sticker. Huawei Accessories. Size: Black:9.8 6 4.5 cm. Galaxy S8/S8PLUS/Note 8 Cases. The earphone holder is suitable for headphones of different sizes and types. You can use it to display your gaming headset, wireless headphones, in-ear earphone, headset for kids, studio headset, DJ headset, etc. Universal Wooden Earphone Headset Hanger Holder Headphone Desk Display Stand. Back You A Tidy Desktop: no kinked headphone cable, no slanting headphone, no scattered desktop anymore, and give a Clean, Tidy, Manageable desktop. 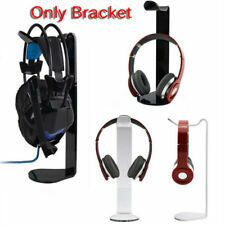 New Acrylic Earphone Hanger Holder Gaming Headphone Display Stand Rack Organizer. 1 x Headphone stand(Not include headphone). Material: Acrylic. hope you could understand. Color: Black,White,Transparent. It will make your computer desk cleaner and more tidy. Strong adhesive strength of the sticker can attach the. 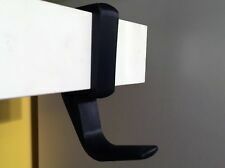 You can also hang other accessories on this holder, such as cables, adapters and so on. and in hallways. 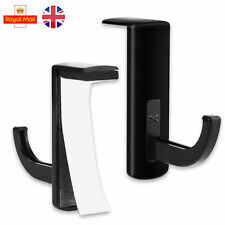 Protable Universal Acrylic Headphone Headset Hanger Holder Desk Display Stand UK. Material: Acrylic. 1 x Holder. Clean the surface before application. Use after 12 hours later when installed for best effect of fixation. Great stand for HyperX Cloud II Gaming Headset, Microsoft Xbox One Chat, Turtle Beach Recon, Sony Headset 2.0 and More. Can be taken apart into 3 pieces for easy transport. Headphone Hanger Mount for Ikea 50mm LACK Shelf. Headphone Headset Holder for Ikea LACK Shelf. 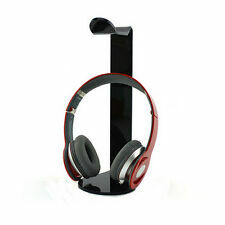 1 X Headphone Holder(Does not contain headphone and other decorations). ❤Perfect headphone storage, keep your desktop clean and tidy. ❤Practical, can put most models of the headphone. ❤Solid wood, good texture, clear wood grain, beautiful, durable, stable. 1× Earphone Bracket. Type: display stand. Due to the difference between different displays, the picture may not reflect the actual color of the item. Material: aluminum (anodized) TPU ABS. Our goal is to make sure that you can find exa ctly what you are looking for and make it easy for you to place your orders. TRIXES Black Self-Adhesive Headphone Space Saving Hanger for PC Monitor. Self-adhesive headphone hanger for easy access to your headphones or headset. 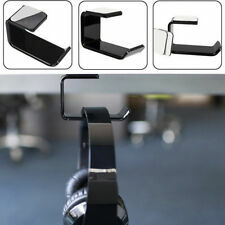 1 x Black Headphone Hanger. 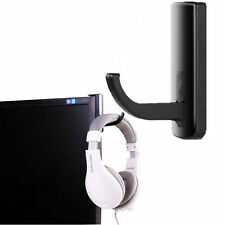 It can be applied to the side of your PC monitor with ease giving you easy access to your headset or headphones. X1 Hex Headset Hanger. - Clean & organise your PC Desk area/work space/gaming area. - Simple design, small in size and lightweight. Fits Ikea Shelves and Shelves up to 25mm - bracket is 20mm wide. Headphone Headset Holder for Shelf. We can make custom shelf headphone brackets to suit any size - just get in touch! Prevent your headphone from scratching. 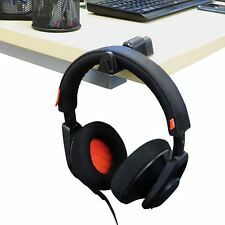 2 x Black headphone holder. It will make your computer desk cleaner and tidier. The strong adhesive strength of the sticker can attach the sticker firmly to the PC monitor and smooth wall or surface with an edge. 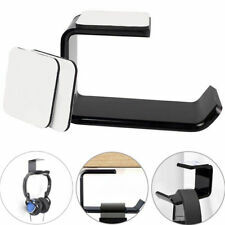 Stainless Steel Headphone Holder Portable Headsets Hanger Universal Paste Wall Desk Mount Hook. 1 x Headset Holder Hanger with sticker. Clean the surface before install sticker;. we do our best give a satisfied solution.